Also from the Art Asylum Blog, here are the dates to write down for San Diego's Comic-Con International in a few weeks. 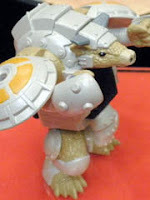 Thursday July 12, 2012 - The Diamond Select Toys booth #2607 will be handing out 200 promotional Battle Beasts Minimates figures. (This will repeat each day of the show, so get there early.) 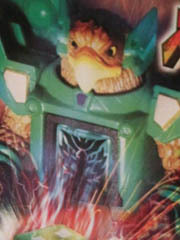 A contest for a Battle Beasts Guitar and Case will be ongoing as well. The Exclusive Vorin and Zik 2-pack will also be on sale. Friday July 13, 2012 - The Diamond Select Toys booth #2607 will host a signing for the IDW comic book with Bobby Curnow (writer) and Ulises Farinas (cover art). Free posters will be available for signing, and the SDCC #1 comic variant will be for sale. Saturday July 14, 2012 - Minimates Panel at 1:30 PM, meeting room 8. While nothing specific is confirmed, it is expected that new figures will be shown here, possibly in addition to items already on display at the booth. More surprises generally pop up along the way, so stay tuned for more as we have it! We now know Diamond Select will be giving away 200 Battle Beasts Minimates figures per day at San Diego Comic-Con! How do we know? This feature has all of their freebie and panel plans, so now you know the big Minimates panel is Saturday July 14, 2012 at 1:30 PM! We also know there will be a build-a-Minimates figure section, which sounds like a lot of fun. Read more about it, here. Luke of Luke's Toy Store sent along this press release, which, with the picture, pretty much tells you everything. As I am a lazy man, I copy and then I paste the release for you. 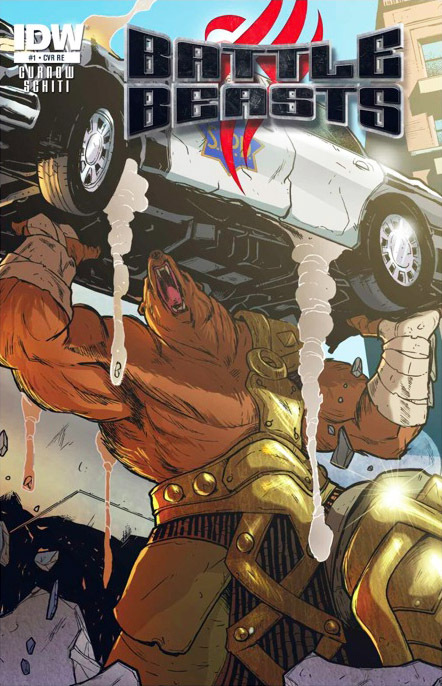 Luke’s Toy Store will be getting an exclusive variant cover of the new Battle Beasts #1 comic by IDW Publishing. This cover features new artwork by Valerio Schiti, and is limited to only 800 copies. While Luke’s Toy Store normally focuses on block figures such as Minimates, their customers’ high demand for this issue allowed an exclusive edition to be created. 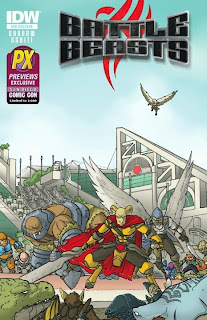 The Battle Beasts series is written by Bobby Curnow (Godzilla Legends, Night of 1000 Wolves) and penciled by Valerio Schiti (Teenage Mutant Ninja Turtles: Donatello, Dungeons & Dragons: Eberron). It focuses on a group of renegade Beasts who return to Earth to protect the ultimate weapon (and the human who activated it) from an armada of their violent brethren. On July 15th, IDW will launch the series with issue #1, and the first full wave of Battle Beasts Minimates will be revealed, which will be at Luke’s Toy Store in late fall of 2012! The first wave of two-packs will focus heavily on characters who appear in the comic, and will have a gameplay element, as well. Luke's Toy Store is a family-run online store carrying Minimates, accessories, and customizing supplies. Luke’s Toy Store recently rebuilt their online store from scratch in order to add over a dozen new features for their customers, include customer accounts, faster checkout, cheaper shipping, customer wish lists, product photo galleries, a new mobile site, and a Luke’s Toy Store news page. Even more new figures have surfaced! The Danger C Twitpic Gallery shows an armadillo, a clear shot of the bunny, a variant gator, a zebra (with painted stripes), and many others. It's hard to not be excited, so check out this gallery (both pages) for more new toys! These posts are particularly notable in that they feature some animals previously unreleased in North America in the old days, like a whale figure (shades of Sea Panic), an Owl, and a previously-unseen (save for THEGODBEAST's customs) an Orca. If you aren't excited about this line, or Diamond's, there's really just no hope for you anymore. So, we ended up having the Lion printed at 80mm to send to them as a reference. It arrived today along with a couple others. The Rhino at 60mm and a totally new figure (not shown). They are going to a friend down south this weekend, who is going to make some silicon molds and repro them. 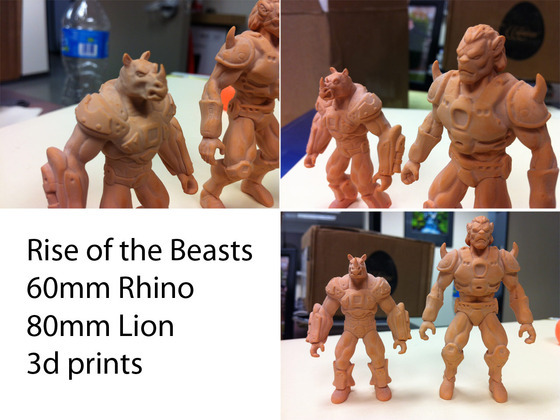 We'll use those to make not only an articulated prototype for the Lion to send to the original (80mm) factory in China, but also articulated proto s of the Rhino and his buddy to send to the current factory we are working with. And we will go from there. At some point (once we get the final gold lion figures from China), if Kickstarter allows it for cancelled projects, I will send out a survey to get shipping addresses from all of you who are due a freebie gold lion. If I can't send the survey, I'll just post an update asking you to email me your info and ship that way. I'll also be posting an update again, if the pricing with the new factory works out and we can bring you the figures at the same price as before. If it doesn't work out, we will just keep on working with the other options that we have going. There have been a few concerns voiced about not being able to get the same pricing on these figures when they do come out, and let me just say that I feel it is kind of pointless to come to market with these UNLESS we can give you that price point." There's more! You can read his info posted to Little Rubber Guys over here and more on Kickstarter over here. On the Faces Book, Diamond Select Toys posted a really slick gallery of Vorin vs. Vik, the 2012 Comic-Con exclusives. To the left, you'll see a delightfully freakish mutation made from mixing the two figures' parts up which begs the question: "Will we get enough parts to cobble together some Wuzzles before 2013 ends?" Many scientists believe the answer may be "yes." Also, some stores will be selling these outside of the convention like sponsor/employer/advertiser Entertainment Earth, check for pricing and availability. 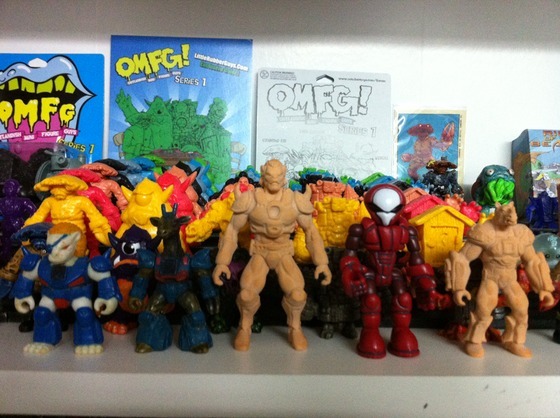 Ad: Want the latest SDCC exclusive Battle Beasts toys, but can't make it to San Diego? You can preorder them at Entertainment Earth today! The retailer is offering Battle Beasts SDCC 2012 Exclusive Minimates 2-Pack for $8.99 and the Battle Beasts #1 SDCC 2012 Exclusive Edition Comic Book for $5.49. With these pictures, we're up to about 28 confirmed figures including solid-color/clear color pack-ins, and these guys might have unique deco as well. They're wasting no time making sure Beast Saga grows into an army! A bull, a couple of birds, a tanooki, and a few others seem to be on deck so this should be an interesting launch. 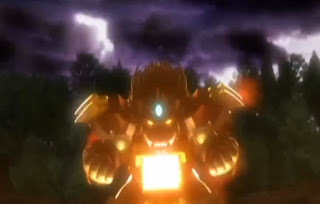 I've received a few emails and noticed a post on Sylvain's site for the new Beast Saga video, which you can see on TakaraTomy.com. It's not quite a commercial, but it is about a minute long, computer animated, and has English narration. We now know there are three beast tribes and we can get a peek at what look like a few more future figures. It's not as memorable (nor as goofy) as Hasbro's original ad, but it does a good job of saying "Here is a new line of figures, also, we enjoyed Dragon Ball Z too." "The first issue of IDW's new Battle Beasts comic book mini-series is here, and SDCC will have its very own cover! 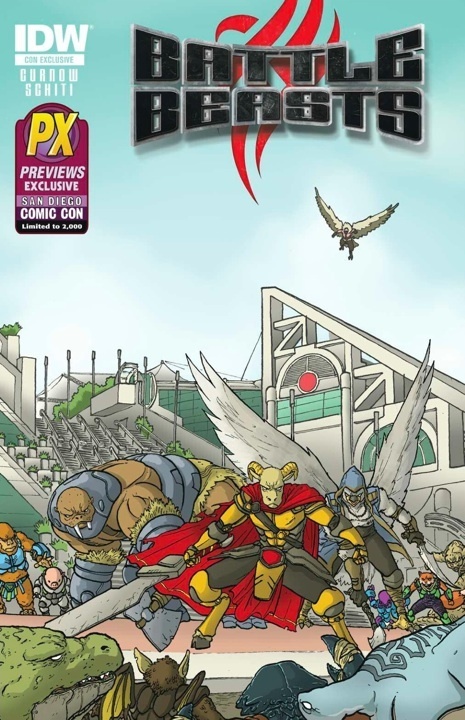 Depicting heroic beasts Vorin, Merk and Gruntos about to do battle on the steps of the San Diego Convention Center, this souvenir edition will be available from Diamond Comic Distributors (Booth #2401) and Diamond Select Toys (#2607), as well as numerous retailers on the show floor." 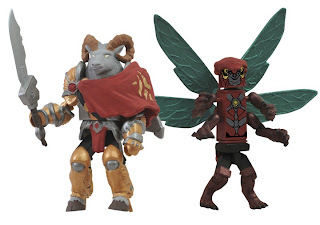 "The first series of Battle Beasts Minimates won't be out until this fall, but Diamond Select Toys is offering fans a preview set that's only at SDCC! 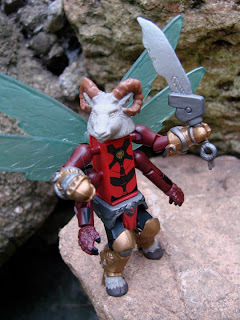 The fully painted two-pack of 2-inch Beasts includes the heroic ram Vorin, star of the IDW comic series, and an all-new villainous dragonfly character, Zik! Available from Diamond Comic Distributors (Booth #2401) and Diamond Select Toys (#2607)." Also exciting was confirmation of a build-a-Minimates station at their booth, although no explicit comments about which brands of parts were made available, nor was pricing on any of these fine items. Stay tuned for more as we have it. 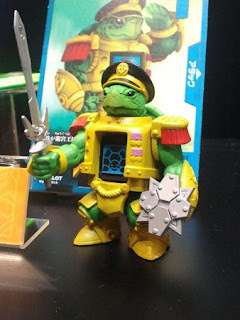 Your pal and mine Sylvain from Dragonautes 2010 posted a new image from Saikyo Jump #7, a Japanese publication which seems to be the best (only) source of new data about Takaratomy's upcoming Beast Saga figures. I grabbed the image and enlarged it in Photoshop, which provides slightly better (but not great) looks at several figures including a few we haven't seen before, like a panda and what may be a cat in some sort of crown. The first wave of these guys is due in Japan in September, and if I read the dimensions on the solicitation right they're expected to fit in boxes which are around 60 mm tall. As always, more as we have it!